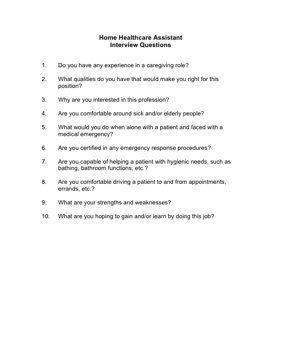 Choose your next Home Healthcare Assistant with the aid of these helpful interview questions. 1. Do you have any experience in a caregiving role? 2. What qualities do you have that would make you right for this position? 3. Why are you interested in this profession? 4. Are you comfortable around sick and/or elderly people? 5. What would you do when alone with a patient and faced with a medical emergency? 6. Are you certified in any emergency response procedures? 7. Are you capable of helping a patient with hygienic needs, such as bathing, bathroom functions, etc.? 8. Are you comfortable driving a patient to and from appointments, errands, etc.? 10. What are you hoping to gain and/or learn by doing this job?